Before Babak’s departure to Canada, we were having a big party at Pascal’s place. Here was Theresa, a Swedish student that someone had met earlier I guess, whoever knows who and how. 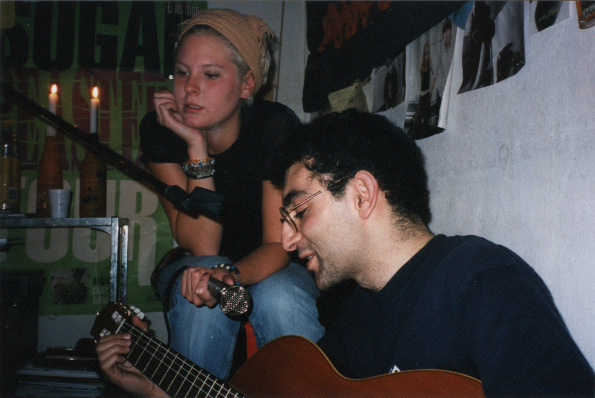 Babak wanted to play a few songs at the party, so he started singing, and Theresa was holding the microphone for him. This is how I took this picture. A few days later, I met Theresa again, as she wanted to play a bit of guitar with me. Actually Theresa was playing guitar very well, and singing incredibly well too! That’s how we recorded the covers of “Rid of Me” and “A Jingle Jangle Morning” this day. I never saw Theresa again! I had lent her a guitar that was actually belonging to my old friend Sophie, so she could practice at home, and we never saw that guitar again. Nobody cares about it though, it’s just a fun story!